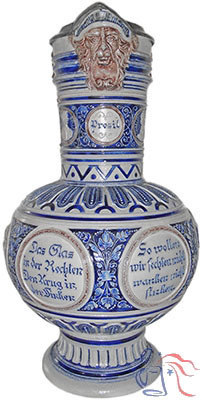 Pottery, relief, 7.0L, pewter lid. 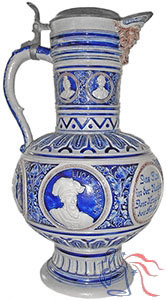 The portraits on this stein are all named, although there appears to be little linking the images other than that they depict well-known personalities during the German Renaissance of the 15th and 16th centuries. The larger portraits around the center of the stein include: Lucas Cranach (1472-1553), painter and printmaker; Albrecht Dürer (1471-1528), painter, printmaker and art theorist; Kunz von Kaufungen (c. 1410-1455), German knight and military commander; and Johannes Gutenberg (c. 1398–1468), inventor of movable type.